We can confidently say this is what it would look like if Skynet made movies. Last month, a Russian YouTuber uploaded an hour-long Grand Theft Auto V remake of James Cameron’s Terminator 2. Now an English-language version exists and, well, an hour is a long time to spend in the uncanny valley. Sure, there’s a rich history of video games being harnessed for animation purposes, whether it’s an original series that borrows assets and textures, or janky looking reenactments of extant media. Garry’s Mod for Half-Life 2 comes to mind, and GTA V has its own small community of animators churning out scenes from Deadpool, Suicide Squad, The Purge, or I Am Legend with choppier characters and desynced audio. The characters’ mouths move the way I’d imagine a horse’s mouth would if it were trying to eat a handful of marbles. 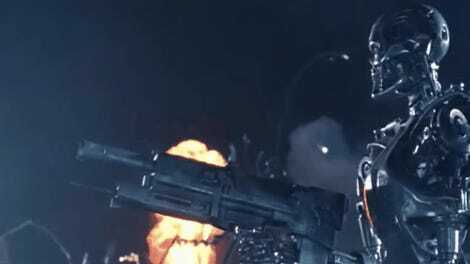 But this Terminator 2 remake stands above the rest for little reason other than it’s a full hour long. It’s basically the entire movie. You, dear reader, can watch Terminator 2. Right now. In GTA V. On YouTube. At least until someone files a DMCA complaint.